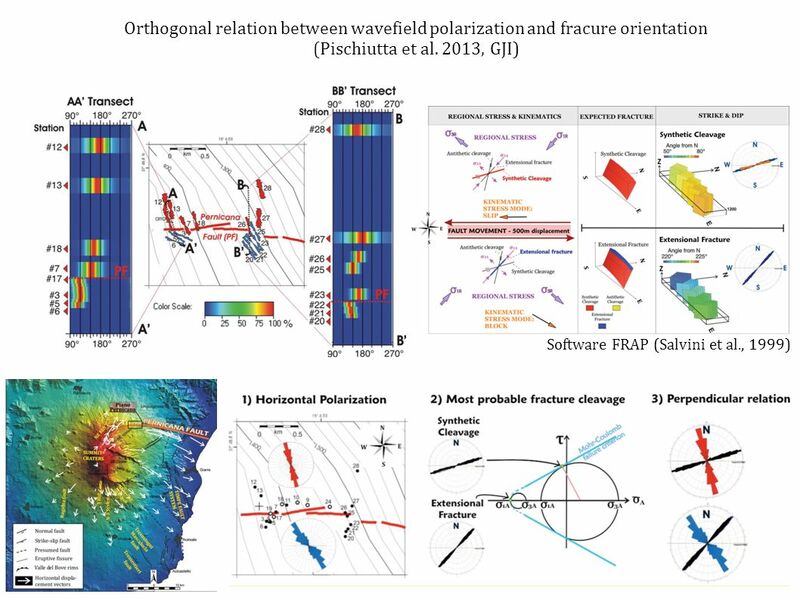 A controlled-source experiment to investigate the origin of wavefield polarization in fault zones Giuseppe Di Giulio 1, Antonio Rovelli 2, Fabrizio Cara. 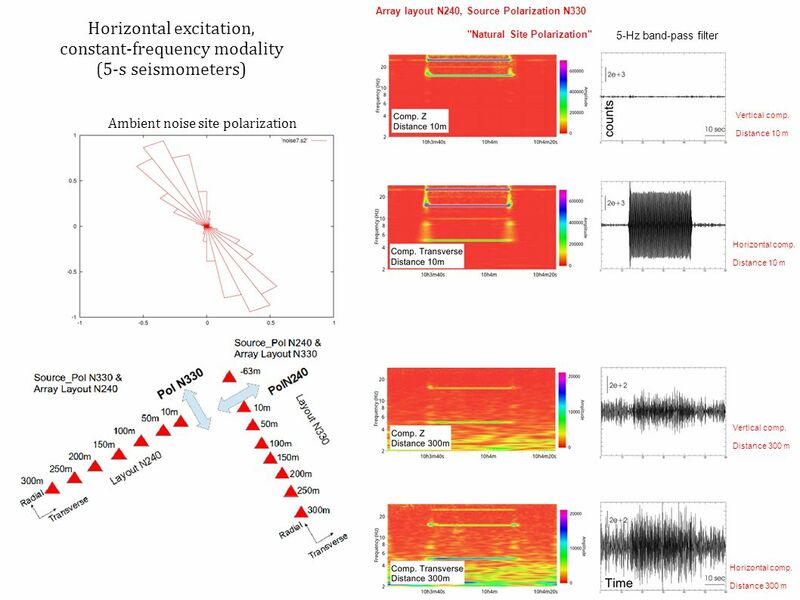 12 Speculations and possible models Controlled-source experiments (horizontal excitation) can provide valuable indications on site effects. 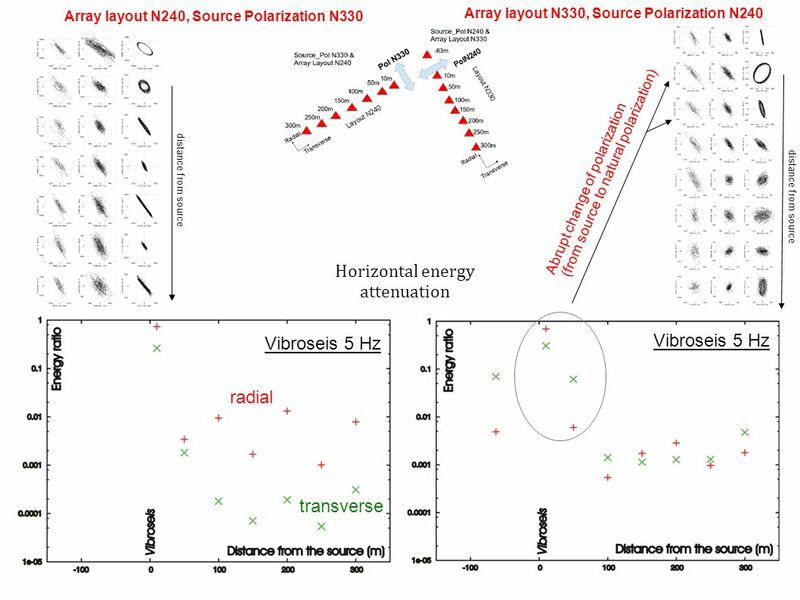 This experiment was successful in confirming that wavefield polarization is a site property. 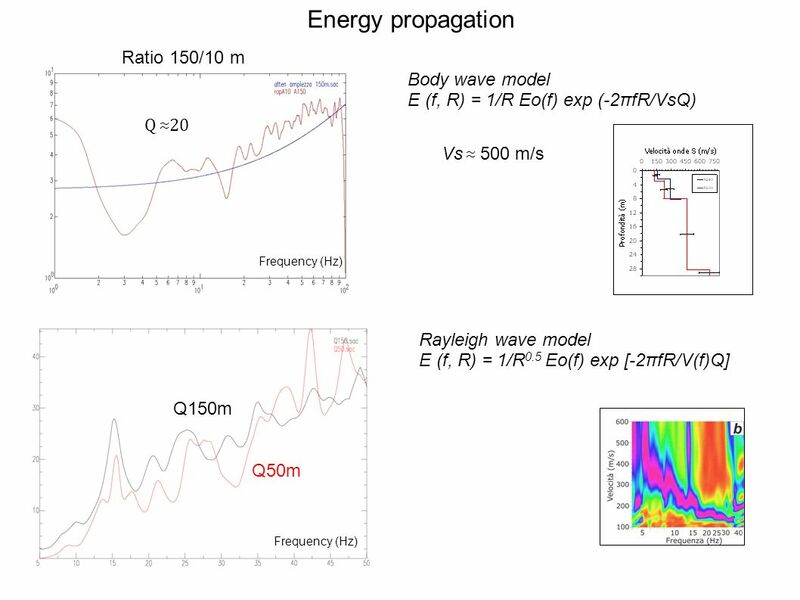 A more refined (smaller distance between receivers) instrumentation would have been necessary to understand the details of seismic wave propagation. Ground motion is controlled by (anisotropic) fracture compliance (see also Moore et al., 2011, and implications for topographic effects). 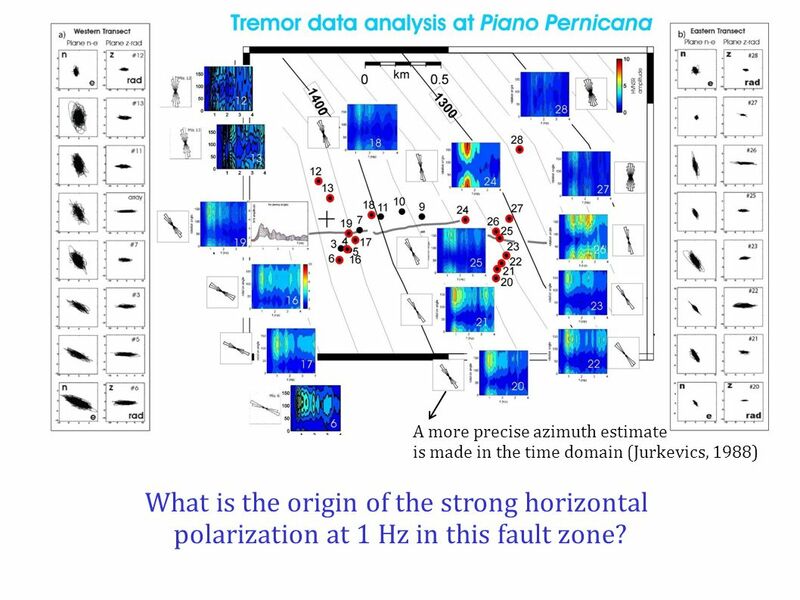 In the fault zone, seismic energy propagates through (viscoelastic?) scattering and mode conversion; out of the fault zone, ground motion tends to be chaotic. 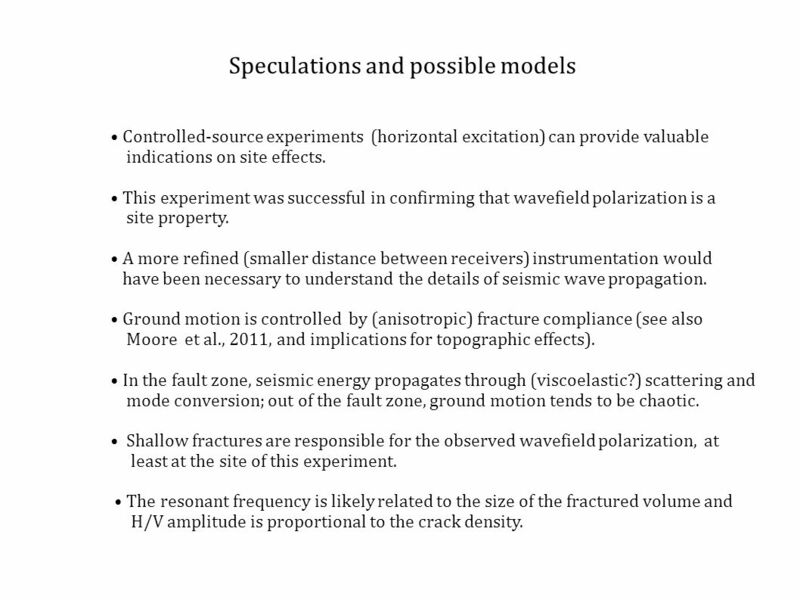 Shallow fractures are responsible for the observed wavefield polarization, at least at the site of this experiment. The resonant frequency is likely related to the size of the fractured volume and H/V amplitude is proportional to the crack density. 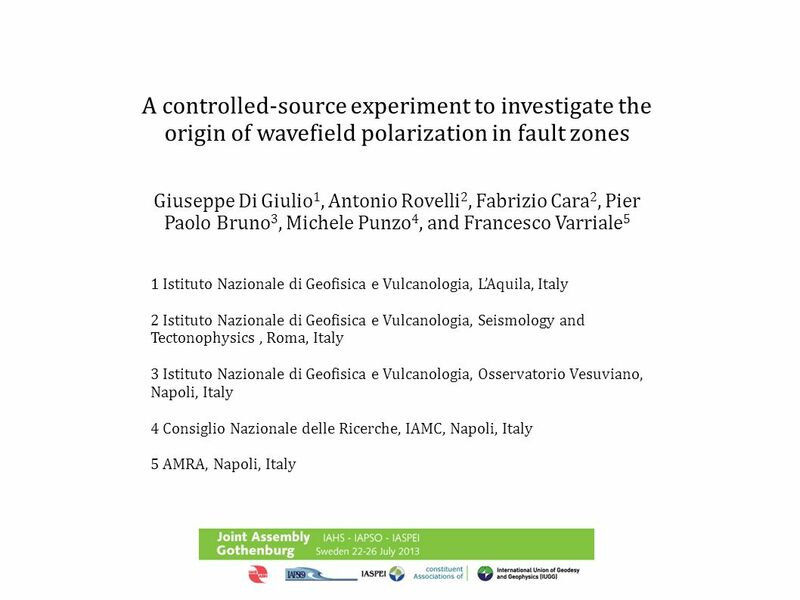 Download ppt "A controlled-source experiment to investigate the origin of wavefield polarization in fault zones Giuseppe Di Giulio 1, Antonio Rovelli 2, Fabrizio Cara." INGV-DPC S4 riunione Siena Aprile 2010 ITACA the Italian strong-motion database Task5 – site classification R. Paolucci, S. Giorgetti Politecnico. 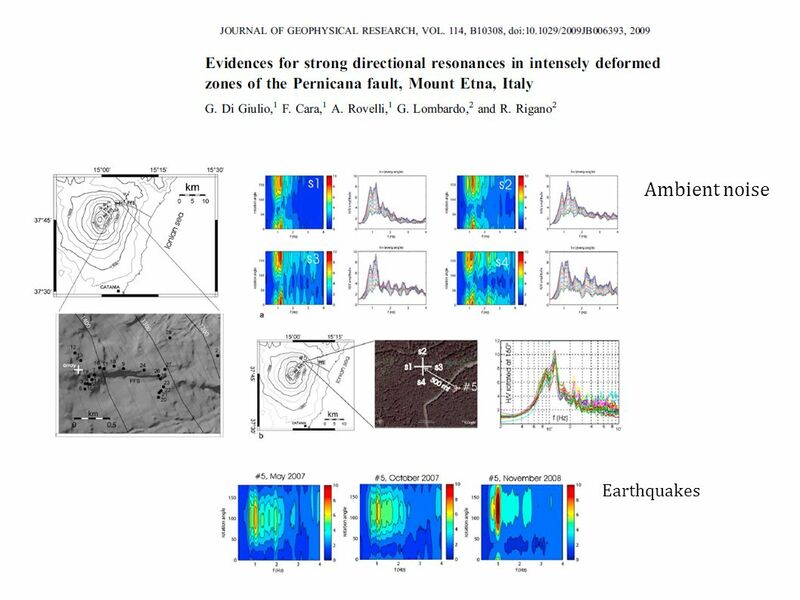 WP 4: Real -Time Shake Maps GRSmap a tool for rapid estimation of ground-shaking maps for seismic emergency management in the Campania Region of southern. Istituto di Fisica dello Spazio Interplanetario A gradiometric measurement of G XCIV Congresso Nazionale SIF Genova, Settembre 2008 V. Iafolla, E.
Misure di rumore sismico (LAquila) INGV-UniRoma3 Corso di Sismologia e Rischio Sismico 8 maggio 2013. 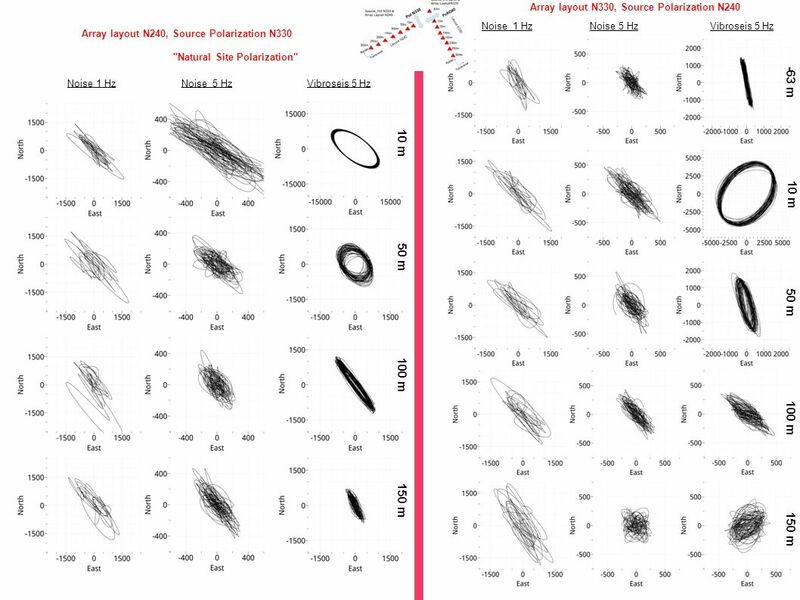 Real-Time Estimation of Earthquake Location and Magnitude for Seismic Early Warning in Campania Region, southern Italy A. Zollo and RISSC-Lab Research. Some ideas on ET1 site Adalberto Giazotto INFN Pisa- EGO. 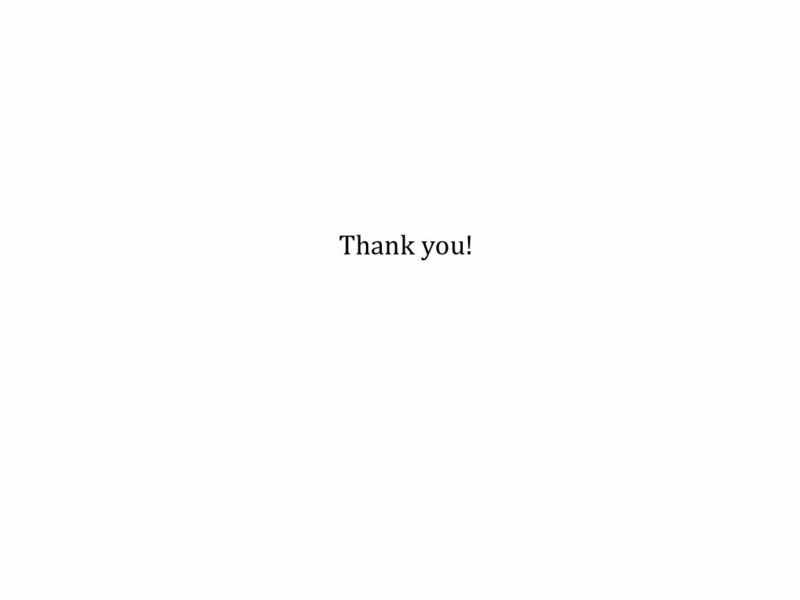 P-wave S-wave Particles oscillate back and forth Wave travels down rod, not particles Particle motion parallel to direction of wave propagation Particles. Application of SASHA for Mt. Etna case Task D: Probabilistic Hazard Assessment Salvatore D'Amico Istituto Nazionale di Geofisica e Vulcanologia Osservatorio. Air Force Technical Applications Center 1 Subspace Based Three- Component Array Processing Gregory Wagner Nuclear Treaty Monitoring Geophysics Division. Development of an In-Situ Test for Direct Evaluation of the Liquefaction Resistance of Soils K. H. Stokoe, II, E. M. Rathje and B.R. Cox University of. Seismic Reflection Ground Roll Filtering Ted Bertrand SAGE 2004. Togliere histogrammii. 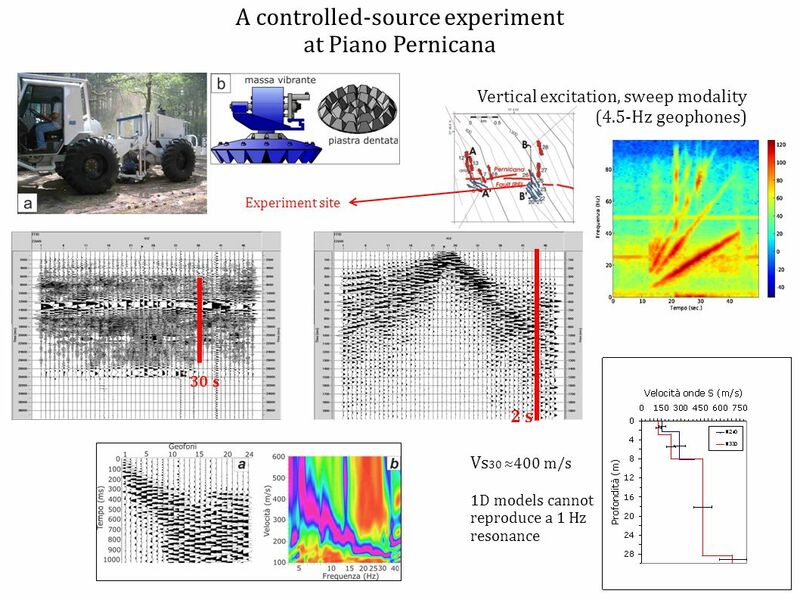 A source-controlled experiment on Mt. 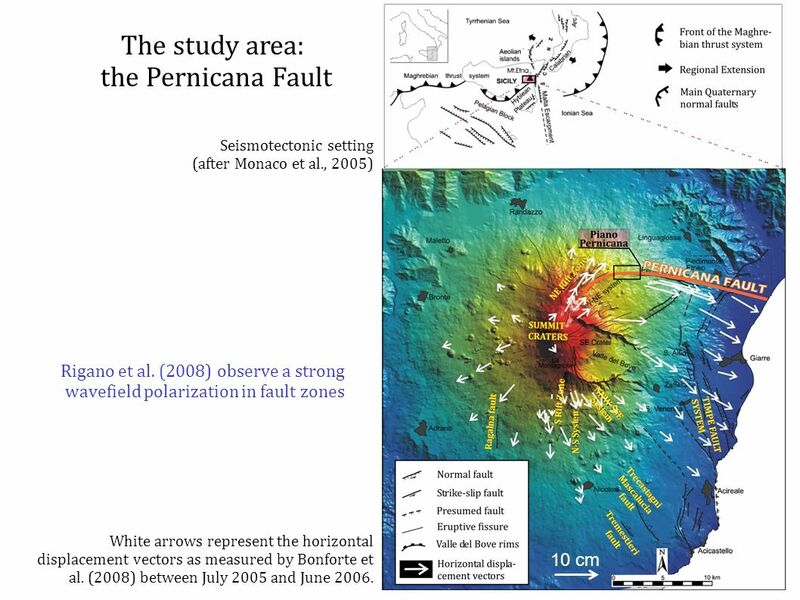 Etna to investigate the origin of wavefield polarization in fault zones Radial component. 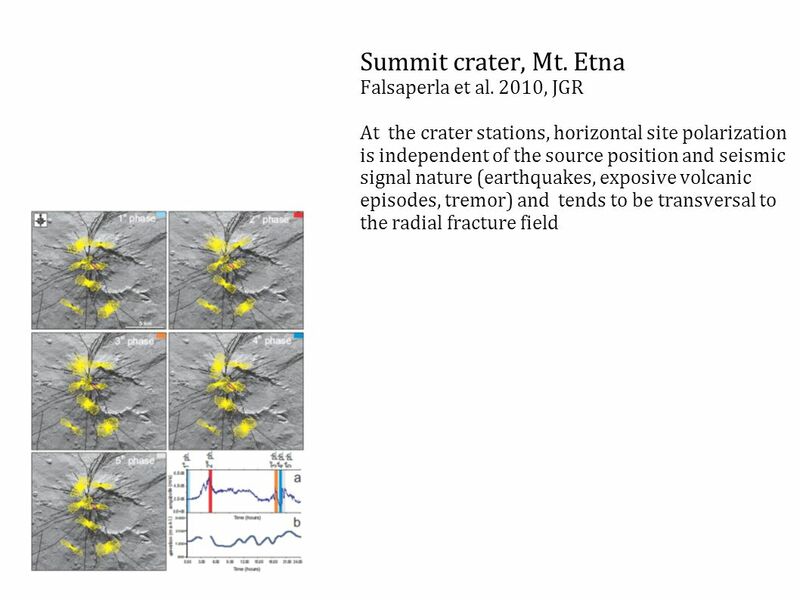 Crustal velocity and anisotropy temporal variations at Etna volcano (1) Istituto Nazionale di Geofisica e Vulcanologia, sezione di Napoli, Italy (2) Seismology.